Also...God isn't real, just so you know. David Hume is most famous for not believing that there was any ultimately rational reason to believe in inductive reasoning. So theoretically, his child should take no more heed of being told something "a thousand times" than once. 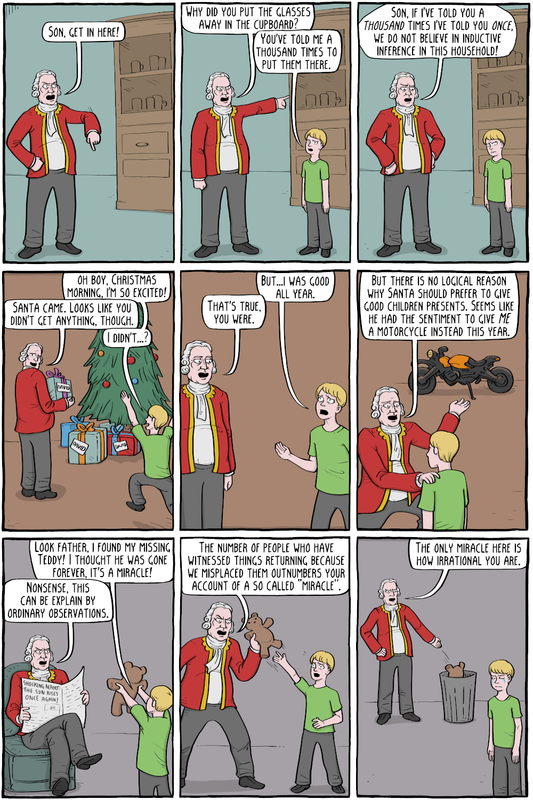 He also thought there was no rational reason to be moral, and morality was just a kind of sentiment that we felt, so Santa might just one day feel like not giving presents to the good kids anymore, and no recourse to logic could dissuade him. His argument against miracles was essentially that a miracle was an observation that went against the "laws of nature". But the laws of nature as we understand are just what we have observed to happen, so reports of miracles are by their very nature a tiny minority report of what usually occurs - an outlier. If we are to apply our normal reasoning process for empiricism, we should then discard them, always, since the number of observations that goes against them always outnumbers the number for them. A t-shirt of panel three is available in the store.